Powerful Neptune, brother of Jupiter and Pluto, god of the sea, had a reputation for having a violent temper. He was often depicted in Renaissance art as a bearded man with long wild hair holding a trident, accompanied by stylized dolphin fish. Those three motifs can be seen here in what is most likely a base for a fountain, a typical placement for this god of water. Although the date of the base is unknown, this design would fit that time period at the beginning of his career, just after his student days at the SMFA. He was sculpting in a more classical “ideal” style, based on mythology and symbolism. 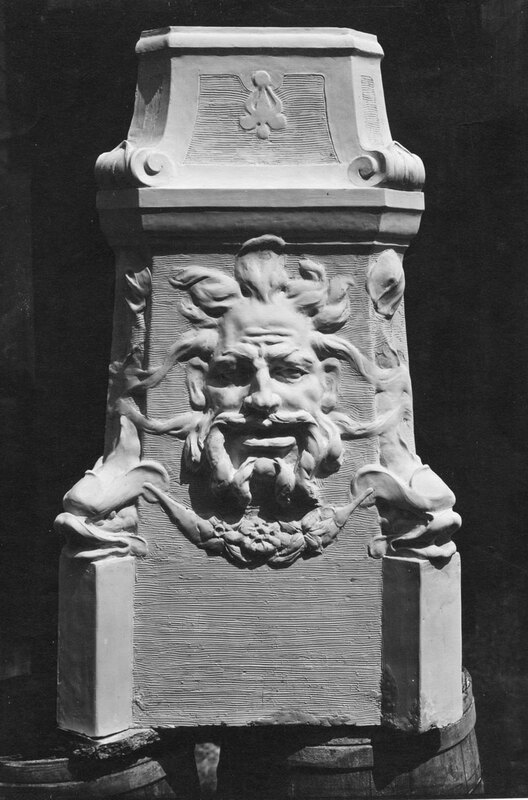 He had studied that period of sculpture and architectural decoration in Paris, did sculptural work for the architect Guy Lowell who designed in the Italian style and Allen called the design of his own sculpture studio “Italianate.” As a student apprentice to Bela Pratt he helped with formal architectural pieces such as the fountain sculptures for the Crane Estate and decorative sculpture for buildings in Boston such as the Boston Public Library, so the style was entirely familiar. Allen records in his diary that he spent many days on a “dolphin fountain” for the wealthy Mrs. Alford of Brookline for her grand home on Heath Hill. Although there are no other dolphin sculptures listed in his oeuvre except at the end of his career, the name may have referred to the dolphin fish at each corner of this fountain base. It may have been topped with an existing sculpture owned by the Alfords or by one of Allen’s other pieces. He had shown her a photo of his “fountain boy” or Boy with a Goatskin already placed at the prestigious Piping Rock Club on Long Island, but there is no record that she bought a copy and the boy has little significant relationship to the style of this work. Looking at the design of the Dolphin and Neptune fountain base, it is in an Italian Renaissance style in the architectural moldings, the subject matter, and the design elements. The shape is a four-sided pedestal with vertically cut corners in a stepped design tapering from the wide footed base to the narrower platform at the top for the sculpture. The smooth surface of the architectural planes and curved molding contrasts with the shaded combed background texture within the panels of the featured portions. Scrolls, swags, leaves and flowers were common decorations in the Roman style and the molding consisted of simple lines and curves when compared to the Greek. Here the stylized trident in floral bud form on a combed ground in the top section and the “diving dolphins” motif can be seen in these embossed book bindings from 1509. A swag of flowers and leaves hangs beneath Neptune’s beard, connecting the dolphins descending on the corners in a very Italian vertical style with uplifted tails. There is good contrast in the light and dark details of the smooth and textured parts of the composition and in the features of the faces of the god and his dolphins. The hair of his beard and head wrap around the sides of the base and over the tails of the fish, uniting the composition in repeated curving lines. As for Neptune himself, what a dynamic, gritty face Allen has created! It shows his wit in making him look like a theatrical and very temperamental wild god! While the Frog fountain work was mid-course between the sculpture itself and the base for it, a Dolphin fountain was ordered. Under “Commissions beginning September 1912,” a Dolphin fountain is listed with a price of $90. The next mention of it is mid-April (4/14/13) as a commission from Mrs. E. Alford in Brookline. To show an example of a fountain, he took a photo of “fountain boy” to his friend Miss Iassigi to send to Mrs. Alford. (4/16/13 Dolphin fountain mentioned in diary) and a few days later (4/17) went to the Alford home to talk about it. Work started 10 days later and continued in concentration for the first three weeks in May. (4/26-5/3, 5/5-6. 5/7 Good days work. 5/9,10,13,14,16,17,20,21) “Mrs. Alford called to see dolphin fountain. Thot is excellent.”(5/23) It was finished June 3rd. This time he didn’t use Torsky to do his casting. The Dolphin went instead to Evans (6/10), his first mention of casting with this foundry. He must have been enthusiastic about the Dolphin because the day before the casting, he “Went to park commis in Boston for permission to place fountain in Gardens. He sent me to art commiss.” No mention was ever made of a placement.